August 7, 2017 – This week, our time machine takes to the skies of Germany as war clouds gather on the horizon, to meet two very different women, united in history by their determination to soar in the brand new — and male-dominated — world of human flight.This week, our time machine takes to the skies of Germany as war clouds gather on the horizon, to meet two very different women, united in history by their determination to soar in the brand new — and male-dominated — world of human flight. Hanna Reitsch and Melitta von Stauffenberg shared talent and courage, but held very different views on the Nazi state — partly because Melitta had a Jewish grandfather, which led her to support the Valkyrie plot, which very nearly succeeded in killing Hitler. 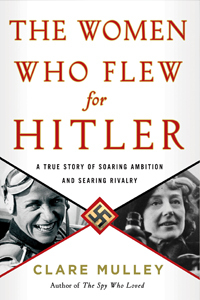 Clare Mulley joins us from the U.K. to introduce The Women Who Flew for Hitler: A True Story of Soaring Ambition and Searing Rivalry . Her previous books are The Woman Who Saved the Children: A Biography of Eglantyne Jebb , which won the Daily Mail Biographers’ Club Prize — and — The Spy Who Loved: The Secrets and Lives of Christine Granville . Granville was Britain’s first female special agent of the Second World War. For more on our guest, visit ClareMulley.com, follow @ClareMulley on Twitter, or toss a like to Facebook.com/ClareMulleyAuthor. Special thanks to M.C. Fontaine of The Bletchley Park Podcast for connecting us with this accomplished author.